Do you browse the mobile web while riding on public transit? I do most of my mobile web browsing and also catch up with email during my hour long daily commute on the BART train. I see a lot of other people doing the same thing on my train. And that’s in spite of the fact that about half of that time the train is in tunnels where there is no cellular reception. I used to wish I could download enough content while I had a connection to carry me through the patches of no reception. That wasn’t possible with my phone’s built in browser which could barely load a single small mobile web page at a time. Opera Mini has completely changed my online mobile online experience. Mini doesn’t have an off-line browsing mode but its ability to load very large (over 100 KB) pages combined with a feature in Bloglines Mobile lets me have continuous browsing the whole trip. Here’s how it works. 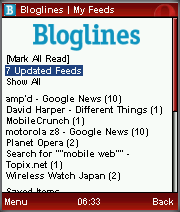 I read about 100 feeds in Bloglines. It’s the main way I keep up with news and technology. So before I get on my bike to ride to the train station, I fire up Opera Mini, launch Bloglines and choose the link that says “nn Updated Feeds” (see image). While you would never know it from the caption, that link loads all the items from all my unread feeds as a single huge web page. I use a flip phone so when I close the flip Opera Mini suspends but, and this is a neat feature of Mini, continues to load the page in the background. When I get to the train station, I open the flip and the huge page is fully loaded with dozens of items – about 30 minutes worth of reading. The tunnels are all on the first part of the trip in the morning so by the time I finish that first page I’m back in an area of connectivity. You can do something similar with Google’s gMail Java application.When gMail starts it loads the headers of your new mail and then it continues loading the email bodies in the background. You can start reading the first email almost immediately and gMail continues to background load the rest of your mail – very cool. Within a couple of minutes all your mail is loaded and you can keep reading even if you lose connectivity. Unlike Opera though, if you suspend gMail by closing the flip loading stops. All data aware mobile applications should be designed with the expectation that connectivity could be lost at any moment. Like Opera Mini and gMail they should offer options to download and cache data whenever they can for later consumption. That’s not the case with most mobile applications. Some mobile browsers, email applications and feed readers not only don’t have any provisions for off-line use but also behave badly when the connection drops – locking up or throwing an error and discarding partially loaded data. I’d like to see Opera go a step further and give Mini users the ability to explicitly save loaded pages for latter browsing. That would make off-line reading a lot more flexible. It seems I’m not alone as off-line browsing is one the most requested enhancements on the Opera Software’s Opera Mini Forum. That makes sense to me, I think a relatively high percentage of mobile browsing occurs on transit where connectivity can be intermittent. A new release of Opera Mini is imminent – you can sign up for the beta here. Major enhancements are promised in this release – here’s hoping that the ability to save and load pages is one of them. This entry was posted in Opera Mini, RSS Readers, Usability by Dennis Bournique. Bookmark the permalink. ok I can download an entire website(mobile version of the website, i mean) on my pc. is it possible that i view the website on java phone offline. I wonder how long until http://gears.google.com works with Opera Mini . . .